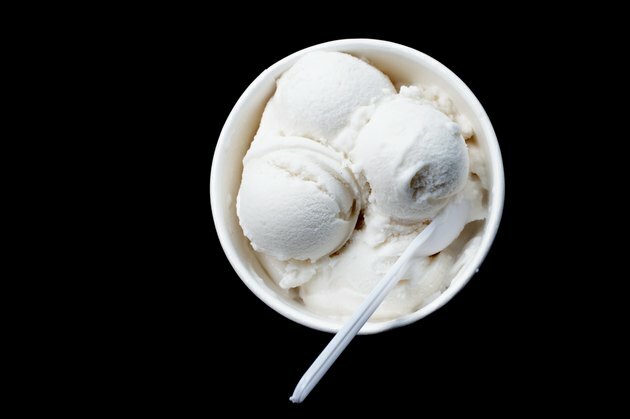 Chest pain after eating ice cream is most likely the result of a milk allergy. Chest pain is a common symptom associated with asthma, which is commonly triggered during an allergic reaction. Until you can be seen by your doctor, stop consuming all dairy products. Chest pain may also be a sign of anaphylactic shock, a rare but potentially deadly allergic reaction. If your chest pain is accompanied with the inability to breathe, facial swelling or throat swelling, call 911. Food allergies can cause chest pain to develop within minutes of eating ice cream. While the most probable allergen found in ice cream is milk, many ice cream brands and flavors may contain other highly allergic foods, such as peanuts, tree nuts, soy and wheat. Read the label carefully to identify ingredients that could potentially be an allergen. The government requires that all pre-made foods disclose the use of highly allergic ingredients by placing an allergy warning on the product's label. The cause of chest pain from a food allergy is the tightening and inflammation in the airways and lungs. During an allergic reaction, the immune system produces immunoglobulin E antibodies, which trigger mast cells to produce histamine. Theses chemicals directly affect soft tissues throughout the body, such as the lungs, sinuses, intestines and skin. Histamine released in your lungs causes your airways to swell and become constricted. This restricts your ability to breathe and causes the opening of your airways to make a high-pitched sound. Chest pain is the result of the extra pressure from the swelling. Because chest pain is a concerning symptom, your doctor may recommend that you see an allergist. The allergist will perform a routine skin test. This test will inject milk proteins in your back or arm to observe whether or not your skin forms redness, swelling or bumps. To confirm a milk allergy, a sample of your blood may be sent to a lab to test for the presence of IgE antibodies. If clinically diagnosed with a milk allergy, you will need to avoid eating ice cream and all other dairy products. Unfortunately, there is no cure for food allergies aside from implementing an elimination diet. An elimination diet is created by your doctor and a licensed dietitian to assist you in avoiding the consumption of certain foods. Many foods contain allergens that you wouldn't suspect. For example, ice cream may contain wheat, gluten or soy ingredients. Do Certain Dairy Products Cause Joint Inflammation and Pain?